Pull on your stockings and your best frilly knickers as you learn to can-can like a true parisian showgirl. This action packed course is full of kicks, jumps, gallops, skirt work, screams and cheeky moves. Oo-la-la! As well as lots of fun this course is great for fitness and improving flexibility. Take a trip back to the 1920’s as you learn the vintage dance moves that were once danced by flappers. The ragtime-jazz music is infectious and you won’t be able to stop smiling as you learn the quirky and witty charleston steps, including grannies knee caps, the hitchhiker and the shoe shine! Fan dancing is a showstopping dance style, elegant and visually beautiful. 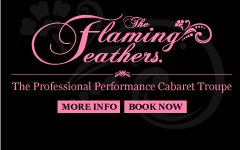 Working with two beautiful ostrich feather fans, you will learn how to ‘hide and reveal’, teasing your audience with the fans, and focusing their attention on illusions of exposure. Fan dancing works on the essence of suggestion and exploits the dancer’s skill of manoeuvre, poise and motion. It combines a blend of style, grace and flirtation with a touch of humour. The fan dance class an exotic and fun way to learn one of the most aesthetically pleasing of all burlesque dance styles. Suitable for novices and experts alike, this class will polish, hone and perfect even the most experienced of dancers. Transform yourself into a true showgirl as you learn all of the cabaret styles of dance including beautiful burlesque, high-kicking can-can, cheeky charleston and fabulous fan dance. By the end of this action packed course you will be posing and teasing like a burlesque star, mesmerizing with your ostrich feather fans, amusing with your quirky flapper steps and flashing your knickers as you can-can! Ribbon dancing is a visual, show stopping and unique form of movement which combines elements of chinese ribbon work and the rhythmic gymnastic form. Ribbon dancing is elegant and graceful, full of flowing aerial movements such as circles, flicks, snakes and spirals. The ribbon dance course is a great way of having fun and improving fitness whilst learning a unique and impressive new skill. Prepare to travel back to the psychedelic 60’s and learn some classic go-go moves including the pony, the monkey, the stomp and of course the famous twist! This fun course is a great way of improving fitness with lots of shimmy’s and shakes and a great excuse to dress up and wear some gorgeous go-go boots. Discover the magic of hula hooping with the Delicious Delilah Di Sgrace… Improve your fitness and have fun as you learn how to spin an adult-sized hula hoop on your body and in your hands. Our beginner’s workshop will take you through a variety of moves with the hoop. Suitable for all ages, no previous experience necessary. Hula hoops are provided. Learn the past paced flicks, kicks and twists or the original retro style of jive dancing from the 1930’s and 1940’s (as seen on Strictly Come Dancing). No partner needed! This course is upbeat and fun making it a great all round body workout! Venture back to the 1920’s and travel through the decades to the 1960’s whilst learning a feast of vintage dance styles. Learn the knobbly knees quirky style of the 20’s Charleston, then the infectious kicks of 30’s/40’s swing dancing. Pick up the pace even more with some twists and flicks of the 50’s jive (no partner needed!) and then save your last bit of energy for the psychedelic style that is 60’s go go dancing! Beginners The beginner courses/workshops are suitable for those with little or no dance experience. They are also suitable for dancers looking to expand their skill and repertoire. The emphasis is based on fun whilst improving your fitness and learning the basis steps and skills of your chosen style. The burlesque course is split into Level 1 and 2 and although not compulsory it is advised level 1 is completed before level 2. Improvers The Improvers courses/workshops are suitable for those with some previous dance experience and for those who have completed the beginner’s courses/workshops. The routines are slightly more faster paced with more characterisation, formation and prop work involved. The burlesque course is split into Level 1 and 2 and although not compulsory it is advised level 1 is completed before level 2. *Please note – Courses & workshops must be pre-booked. Places are limited and normally get fully booked so book early to avoid disappointment! *Please note – Courses & workshops are non-refundable.